Bua Tong Waterfalls – Hidden in the rainforest is a playground for nature lovers and one of the most beautiful waterfalls in Thailand is named Bua Tong the Sticky Waterfall. The Bua Tong Waterfalls are located about 60 km north of Chiang Mai City, in the Sri Lanna National Park. 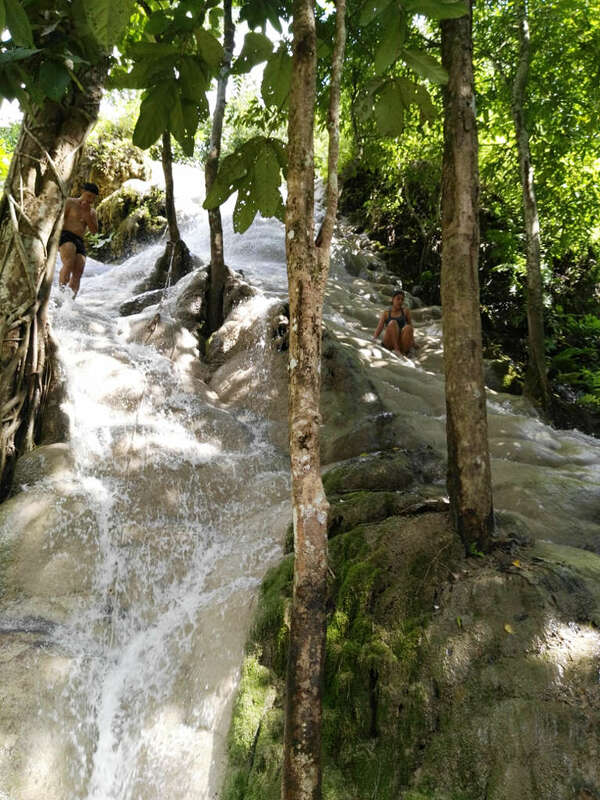 Not many people know Bua Tong waterfall, as well off the main tourist track. Chiang Mai Tours by your Travel partner Easy Day Thailand. At the entry you will find a little well maintained Park, with an open grass area, a bathroom, a small hut serving drinks and ice cream. This is the place where you can find locals picnicking on the grass and exploring the waterfall. Signs point you the the way to a little trail that led you to the beginning of the falls, and it quickly became apparent why they were called “sticky falls” by the locals. Food is not allowed to take with you down in the waterfall, but there are plenty of picnic tables at the area of the Park entrance. It´s a series of horsetail that cut through the jungle landscape, but what makes them unique is that they flow over tiers of limestones. Water is constantly rushing over the limestones. But the surface of the limestone has an almost sticky feel that creates great traction with skin. You can walk down the Waterfalls as if there were no water at all. The waterfall consists of 3 tiers of falls with flat stretches of streams in between. Enjoy a great time climbing up and down the falls and you feeling more and more secure on the sticky limestone as you can believe. But be prepared to work muscles in your legs you never knew they existed. And if you don’t plan on getting wet over the rocks, there is a path that take you down the various levels of the Falls. Take a shower,climb,swim or stay for a picnic and take the change to grab a few photos from this stunning place . Take highway 1001 up north, past Mae Jo for about 1.5 hours. Around 18 km before the waterfall you will see a metal sign for the waterfall. Stay on that road until you see another sign telling you to turn right. The road is very easy and the road leading to the waterfall is hard to miss. Parking : You will find free parking places inside in front of the park .